Today's tip goes out to the men...those stinky boys--you know the ones. And if you are one, well, you'll know if you are one after reading this post. Here are a few tips to make getting a date a little easier. 1. SHOWER We women love a man that smells nice. So SHOWER, and SHOWER at least once a day! If you play sports, have a job that requires a lot of sweating, or work around a lot of french fries, it would be great if you showered twice a day!!! SHOWER AFTER WORK before going out!! All of us women will appreciate it. 2. BRUSH YOUR TEETH Nothing deters a woman more than bad breath. Brushing at least twice a day, once in the morning and once before bed, is advised. If you are going out or going on a date, then BRUSH BEFORE THE DATE!!!! 3. Listerine & Chewing Gum Gargling with mouthwash adds that little bit extra to get super fresh breath! Also keep minty gum with you for those stinky breath emergencies. 4. Floss Ok, ok, last one about the teeth. Please, please floss. Most everyone brushes, but not everyone flosses. Several times I have been approached by a guy who seems alright, only to have my opinion of him completely change when he smiles and has a disgusting yellow build up between his teeth. Ewwww, turn off!!! 5. Deodorant Don't forget the deodorant, or the shower will be almost rendered pointless. 6. Cologne Wear it, but DO NOT OVER DO IT!! You see, in case you didn't know, we women must breath oxygen to survive. So if your overindulgence of cologne (especially if you are using it to cover for not showering, LORD FORBID), is sucking up all the clean oxygen within a 10ft radius, well you'll just have to be satisfied with yelling at us from across the room because WE WILL DIE if we get any closer!! So from now on, one spritz to the neck or chest and a second to the wrist, no more, please, there is enough air pollution coming from that Hummer over there. 7. Exfoliate Yes, men, exfoliation is for you too. Get a nice facial exfoliater like Burt's Bees Natural Acne Solutions Pore Refining Scrub. This will help with all the razor bumps and ingrown hairs and zits. Women have the luxury of covering their flaws with make-up, but men don't. So you've got to keep your skin in pristine condition, sorry. 9. Water & Fruit Juice Water and fruit, help with the B.O. So drink extra water and lots of fruit. Cutting back on the garlic and onions also helps. Bonus: The extra water also helps with acne. 10. Moisturizer That's lotion, guys. I personally like a man with smooth, nice skin, No ashy-ness! Using a little lotion on your face and limbs will keep your skin looking fresh. And that's my tip for the day, hope it helps all of you get dates for the weekend! 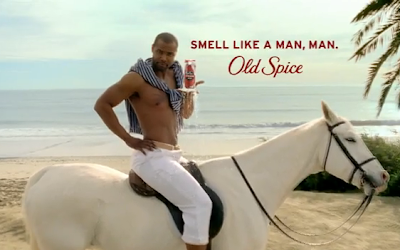 Remember guys, those Old Spice and Axe commercials have some truth to them! !